Tank-mounted speedometer features attractive chrome instrument housing. Instrument lights mounted inside meter for optimum visibility. 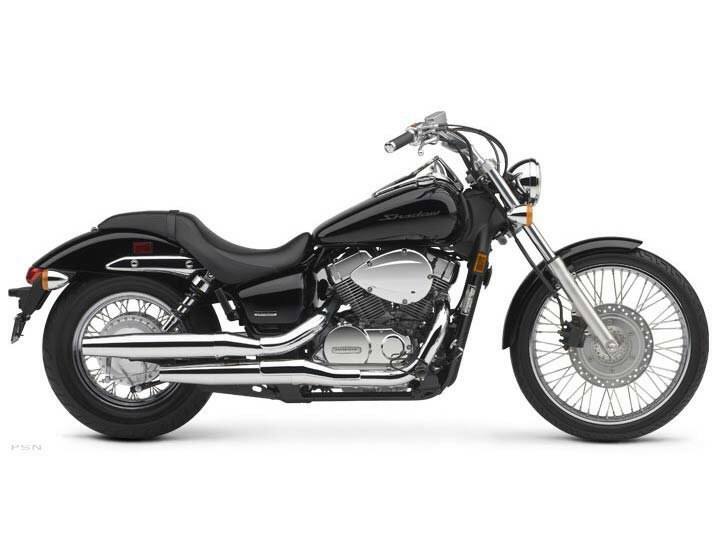 Chrome highlights include cylinder-head cover, air-cleaner cover, left and right engine sidecovers, brake and clutch lever brackets, rear brake pedal, shift lever, swingarm pivot cap, ignition switch cover, handlebar, rear shock covers and headlight. Solid aluminum footpegs with wide rubber trim bands project a custom-made look. Handlebar is positioned low and wide for a comfortable feel and is mounted on rubber-cushioned risers to reduce vibration. Broad, low-slung solo seat with detachable passenger seat. Large, custom-styled taillight and attractive retro-styled turn indicators. Steering-head lock and helmet lock for added security when parked. Innovative frame design features large, steel tube backbone reaching back from cast steering head to rear of the engine case for simplicity and strength. Sturdy and responsive 41 mm front fork features large-diameter chrome-steel shrouds and large billet-aluminum triple-clamp for a distinctive retro look. Delivers confident, neutral handling and plush 4.6-inch wheel travel. Large 4 mm thick fork brace mounted under fender enhances rigidity. Dual-shock rear suspension features five-position spring preload adjustability and eye-catching chrome covers, while offering 3.5 inches of wheel travel for a smooth ride. Speedometer is set into the front of the fuel tank for classic retro styling. Crankshaft features long-stroke design along with high-mass ACG to produce strong V-twin feel and low-rpm torque peak. Single 34 mm constant-velocity (CV) carburetor offers crisp throttle response. Three-valve cylinder-head design utilizes two spark plugs per cylinder for excellent combustion efficiency and high power output. Finned cylinders enhance appearance and give a big-bike look. Aluminum radiator maintains consistent engine temperature for optimum performance and long engine life. Mounted between frame rails for enhanced appearance. CD ignition with electronic advance offers dependability and is maintenance-free. Air-injection system reduces emissions by injecting air into the exhaust ports to ensure complete combustion. A 21-inch front wheel for a narrow, custom look and light steering feel. Newly designed handlebar offers sporty, street-rod feel. New custom, integrated taillight design. 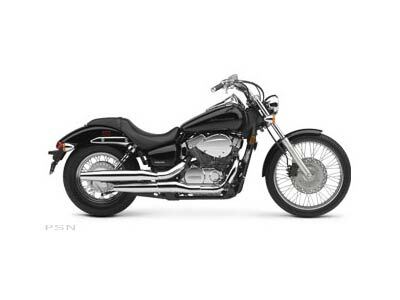 Sleek two-into-two exhaust system features bullet-style mufflers for a classic street-rod style. Incredibly low 25.7-inch seat height. New colors include Ultra Blue Metallic, Black with Flame, Red with Flame and Black.